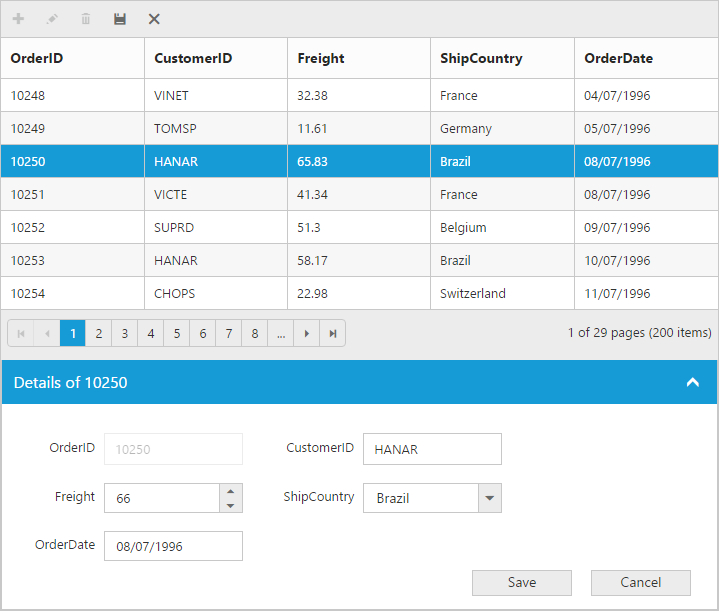 The grid control has support for dynamic insertion, updating and deletion of records. You can start the edit action either by double clicking the particular row or by selecting the required row and clicking on Edit icon in toolbar. 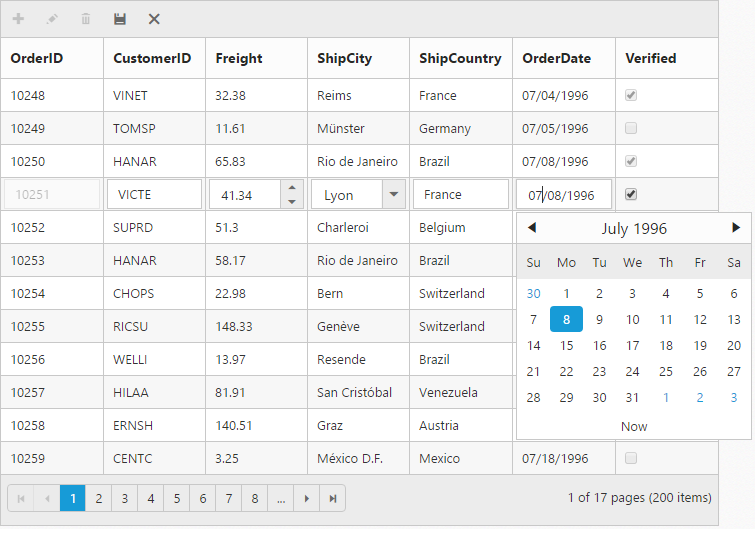 Similarly, you can add new record to grid either by clicking on insert icon in toolbar or on an external button which is bound to call addRecord method of grid. 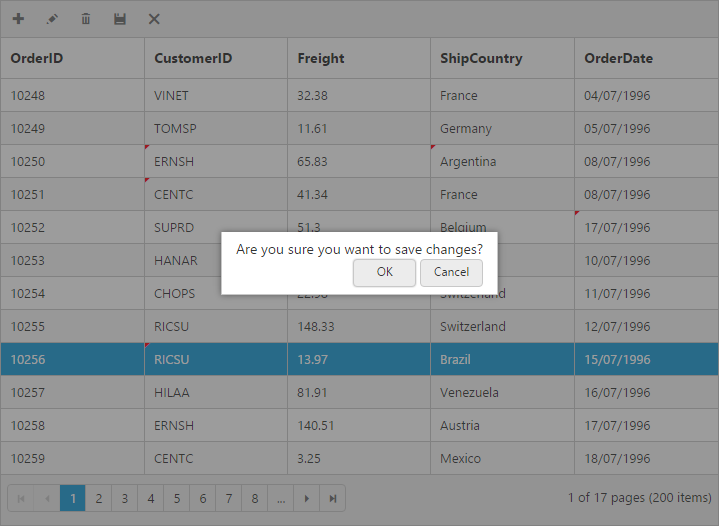 Save and Cancel while on edit mode is possible using respective toolbar icon in grid. The primary key for the data source should be defined in Columns definition, for editing to work properly. In Columns definition, particular primary column’s IsPrimaryKey property should be set to true. Refer the Knowledge base link for more information. And also you can define the model for all the editTypes controls while editing through EditOptions. The following table describes EditType and their corresponding EditOptions of the specific data type of the column. Create - It is used to create the control at time of initialize. Read - It is used to read the input value at time of save. 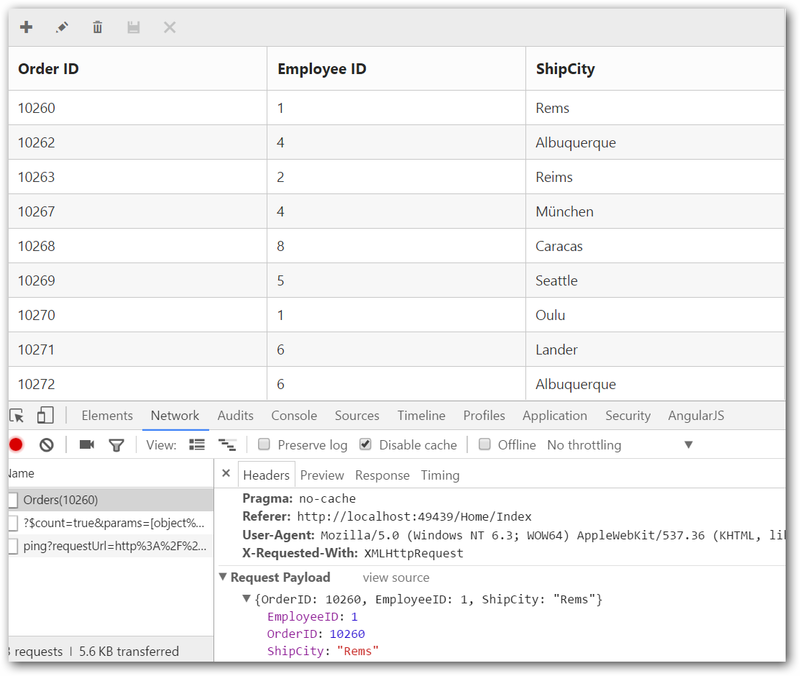 To edit the records using Inline template form, set EditMode as InlineFormTemplate and specify the template ID to InlineFormTemplateID property of EditSettings. After the template elements are converted to JS controls using actionComplete event. 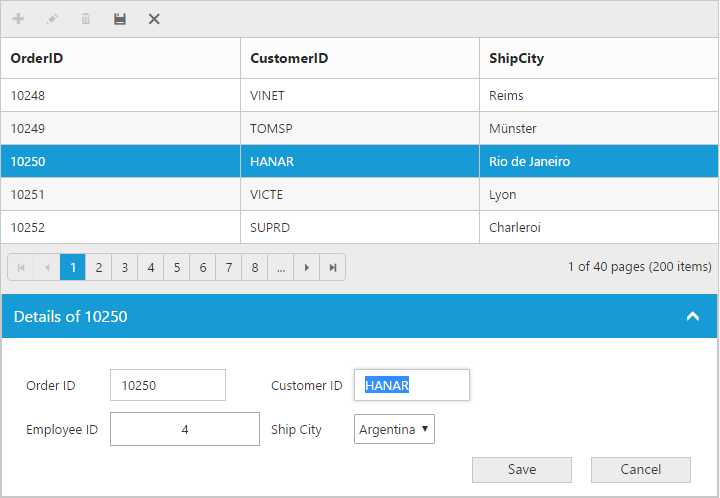 To render the EJ MVC form controls like DatePicker, Dropdownlist, NumericTextBox in the template edit form, from the partial view, refer the KB How render ejControls in the Edit Form Template of the MVC Grid. 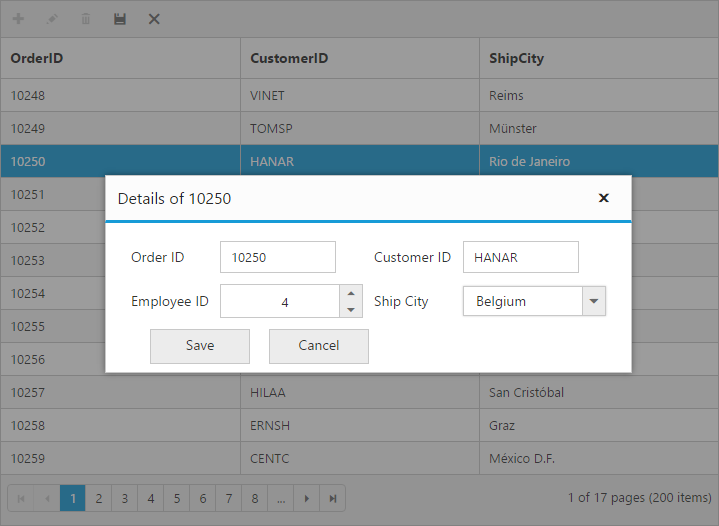 To edit the records using Dialog template form, set EditMode as ‘DialogTemplate’ and specify the template id to DialogEditorTemplateID property of EditSettings. This can be achieved by setting the FormPosition property of EditSettings as ‘TopRight’ or ‘BottomLeft’. You can set validation rules using ` ValidationRules property of Columns`. The following are jQuery validation methods. Grid supports all the standard validation methods of jQuery, please refer the jQuery validation documentation link for more information. To return custom validation message from server end, please refer this KB link. 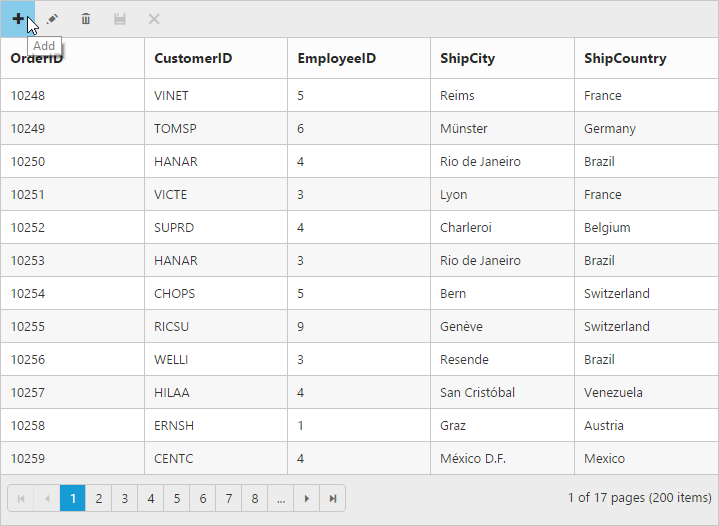 All the CRUD operations in grid are done through DataManager. 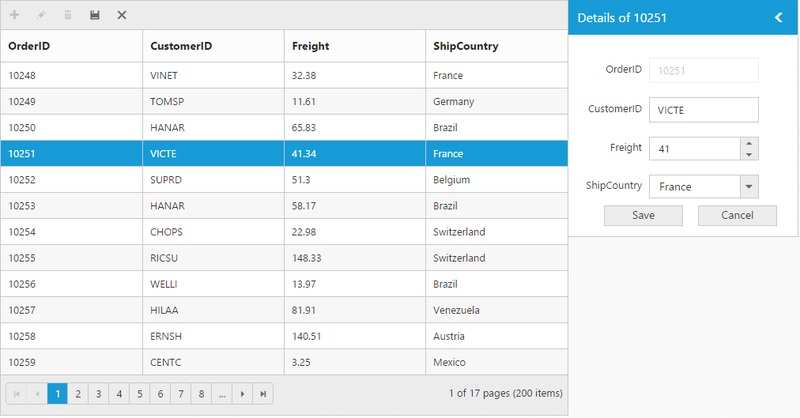 DataManager have an option to bind all the CRUD related data in server side. Please refer the [‘link’] to know about the DataManager. You can use the UrlAdaptor of DataManger when binding datasource from remote data. 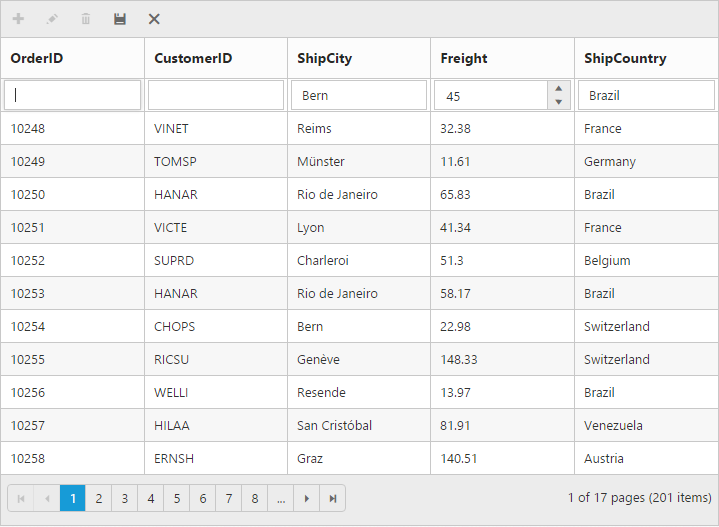 At initial load of Grid, using URL property of DataManager, data are fetched from remote data and bound to Grid. 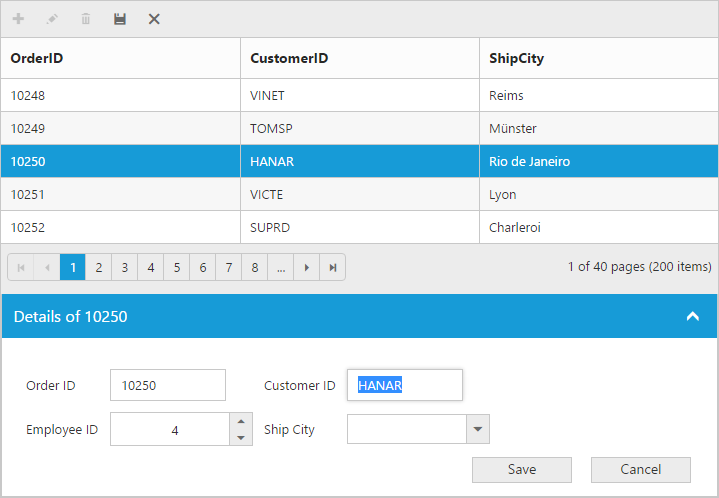 You can map CRUD operation in Grid to Server-Side Controller action using the properties InsertURL, RemoveURL, UpdateURL, CrudURL and BatchURL. Also when you use `UrlAdaptor`, you need to return the data as `JSON` and the JSON object must contain a property as `result` with dataSource as its value and one more property `count` with the dataSource total records count as its value. The following code example describes the above behavior. Also, using ‘DataOperations’ helper class you can perform grid action at server side. The in-built methods that we have provided in the DataOperations class are listed below. 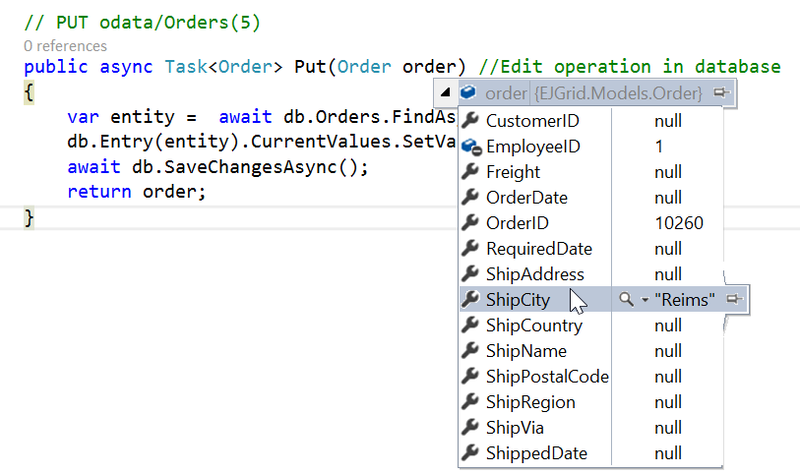 Using InsertURL property, you can specify the controller action mapping URL to perform insert operation at server side. 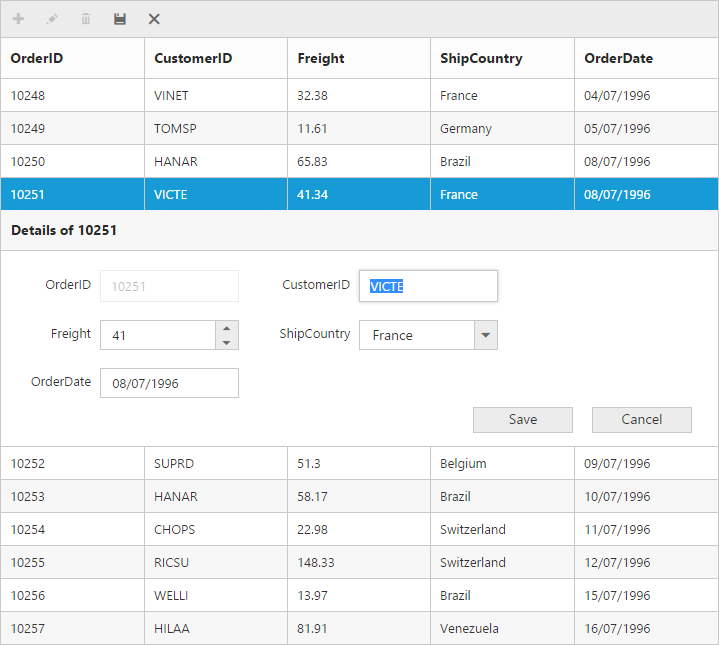 The newly added record details are bound to the ‘value’ parameter. Please refer the below image. The updated record details are bound to the ‘value’ parameter. Please refer the below image. Using RemoveURL property, you can specify the controller action mapping URL to perform delete operation at server side. Instead of specifying separate controller action method for CRUD (insert, update and delete)operation, using CrudURL property you can specify the controller action mapping URL to perform all the CRUD operation at server side using single method. The BatchURL property supports only for batch editing mode. 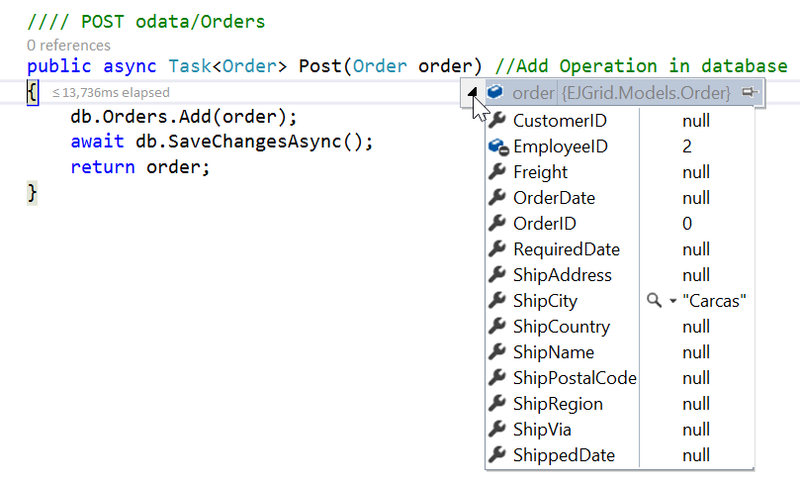 You can specify the controller action mapping URL to perform Batch operation at server side. To consume ODataV4 service, set the service link to the Url property of Grid DataSource and you can set Adaptor type as AdaptorType.ODataV4Adaptor to the Adaptor Property of Grid DataManager. 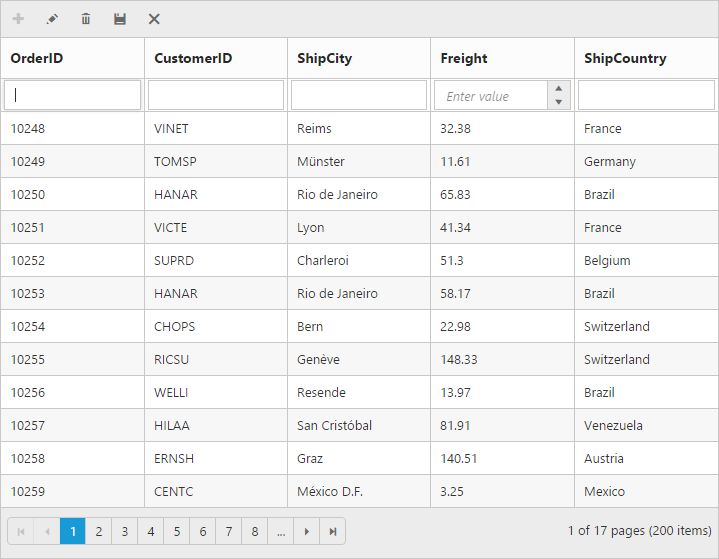 We can bind this DataManager as dataSource for the Grid. To perform the CRUD Operation in ODataV4 we need not explicitly mention any URL for Insert, Update or Delete operations in grid instead we can retrieve it using the `PUT`, `POST` and `DELETE` semantics of the OData which will be handled on the URL property already specified. The following code example describes the above behavior. The Get method returns the entire Order collection. 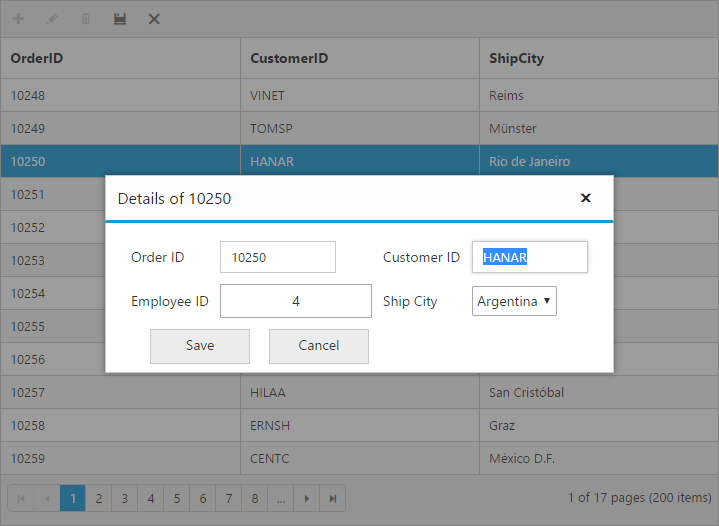 This Get Method returns the data to the Grid from the database. 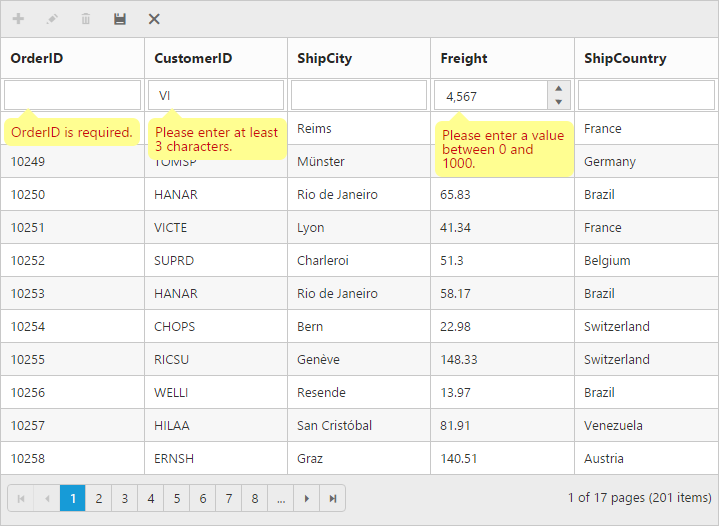 To add a new data to the database, add the following method to controller page. Please refer the below image. 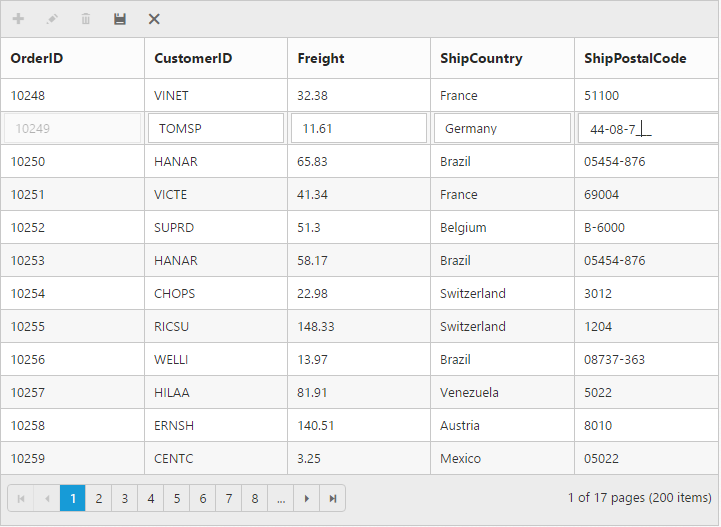 Here the newly added record details are bound to the ‘order’ parameter. To update an existing data from the database, add the following method to Controller page. 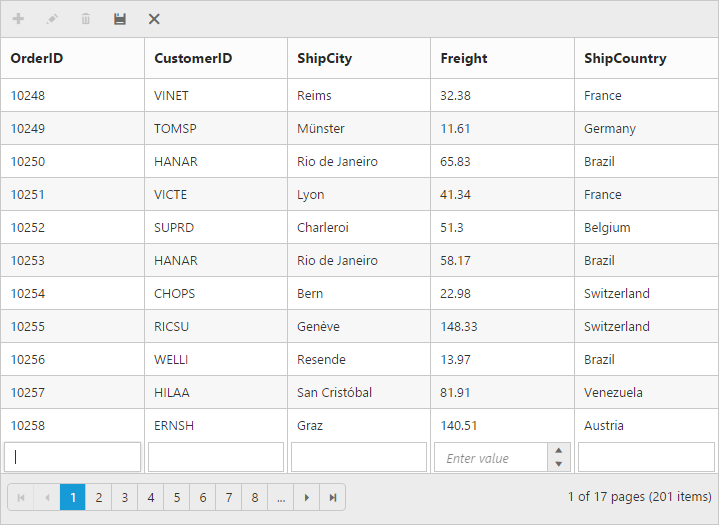 Here the modified row data will be obtained in the order parameter. 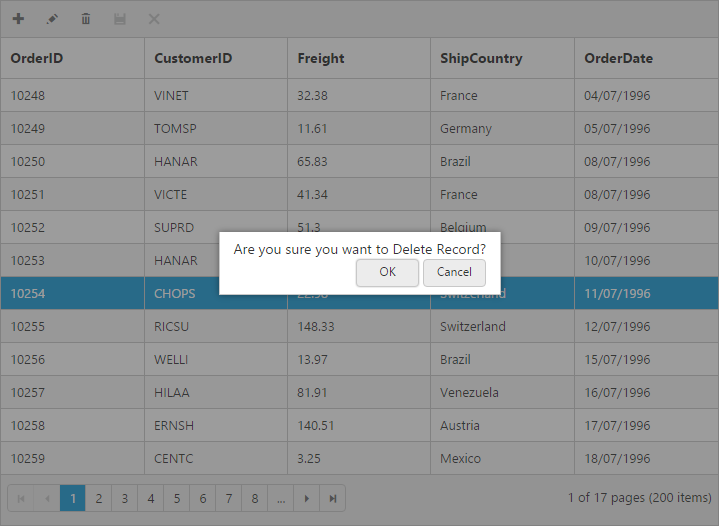 To delete a data from the database, add the following method to controller. The deleted record primary key value is bound to the ‘key’ parameter. 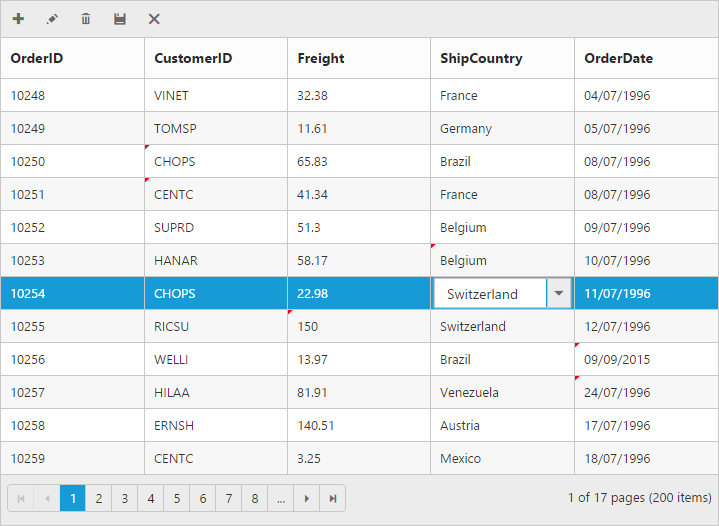 To add new row in the top or bottom position of grid content, set RowPosition property of EditSettings depending on the requirement. 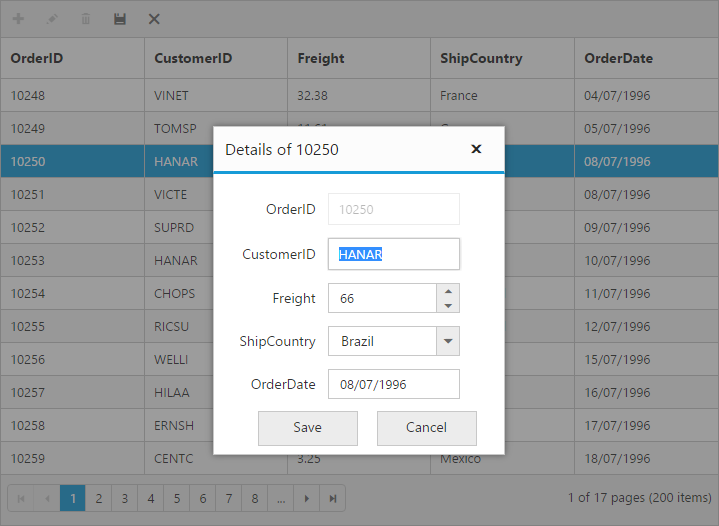 The blank add new row is displayed in the grid content during grid initialization itself to add a new record easily. To enable show add new row by default, set ShowAddNewRow property of EditSettings as true. 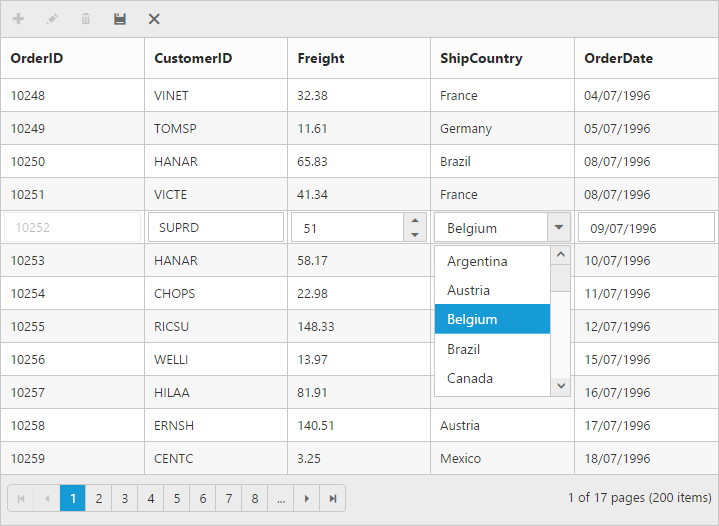 While adding new record in grid, there is an option to set the default value for the columns. 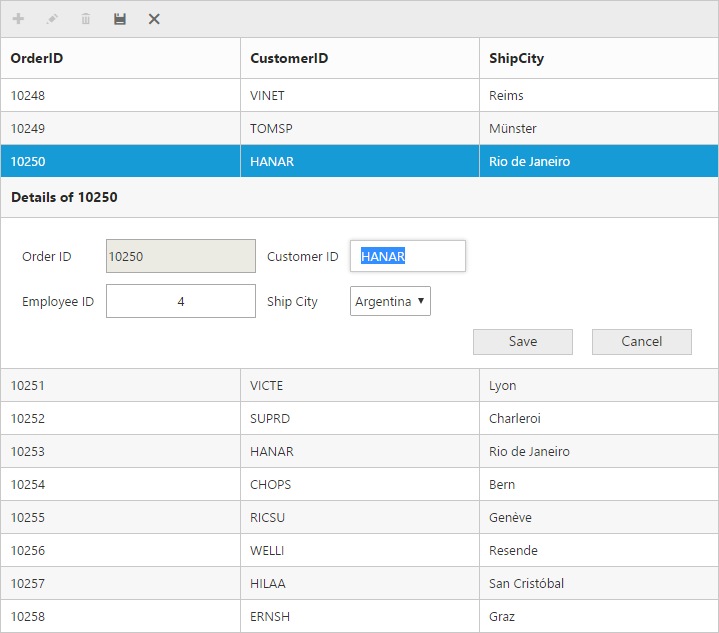 Using DefaultValue property of Columns you can set the default values for that particular column while editing or adding a new row.